From Cucumber Berliner to Guava Nectarine La Folie, the fruit-forward fest offered a farmers' market full of flavors. 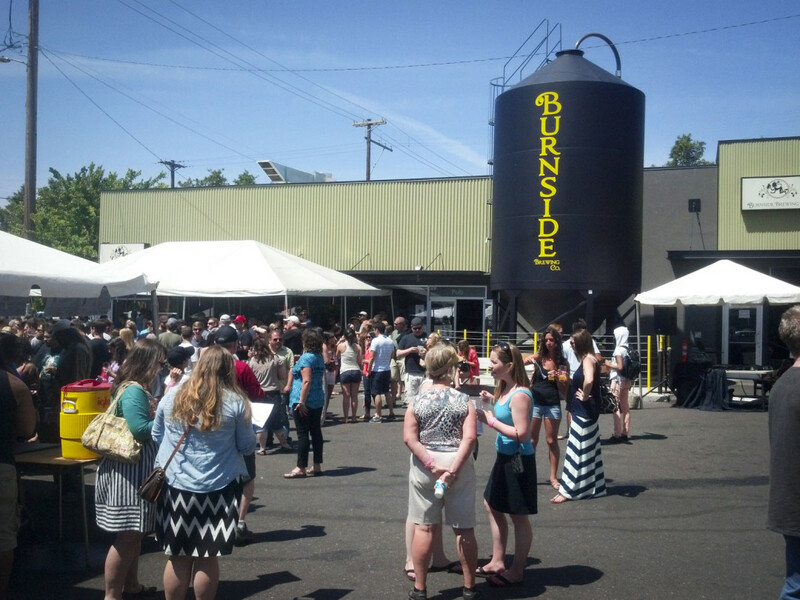 The sun-splashed Burnside Brewing parking lot and neighboring strip of NE 7th was the fitting location for what could have passed for a farmers market—albeit a 21+ farmers market with enough puns to make you pucker like the first sip of Passionfruit Sour Ale. Baker City outfit Barley Browns served up an India Purple Ale, the marriage of Concorde grape juice and a healthy amount of experimental hops, which tasted like picking fresh grapes off a neighbor’s overhanging vine while out on a warm evening stroll. In the best way possible, you could even taste the seed. Hopworks’ Organic Fruit Cocktail was brewed from the sustainably harvested juice of the five fruits defined by the USDA as “fruit cocktail”—40% peach, 35% pear, 10% pineapple, 10% grape, and 5% cherry. The festival's hosts, Burnside Brewing, collaborated with EZ Orchards Cidre to concoct Nero’s Fiddle, a Belgian-style graff made from a blend of late harvest Roman Beauty, Pink Lady, and Granny Smith apples. So, you're now on board with the basics? How bout a few offerings that really up the adventure factor? Upright Brewing’s NecTørr was an intense dark rye Saison, aged in Aquavit barrels with dried persimmons and pomegranate, and would have not been out of place at the Holiday Ale Festival. Portland’s cider revivalists, Reverend Nats’ Hard Cider, proved that adventure doesn’t have to be dark and stormy, with the sweet/spicy Habañero, Aji, and Ghost chili “pineapple wine” Tepache. It wouldn’t be a local beer festival, though, without a few nods to the home state, and little else pays homage to an Oregon spring than local berries. Eugene’s Falling Sky Brewing’s Marionberry Smoked Ale, made from house-smoked peach wood malt and over 100 lbs of Oregon-grown Marionberries was perfectly tart, with accents of smoke, and a dark fruit finish. Corvallis’s Flat Tail Brewing aged their White Tail Wit with Oregon blueberry puree and Brett B yeast for the sourness of a handful of first-of-the-season berries you couldn’t wait to eat, but probably should have. As if that would stop you! Continuing the Oregon love were Fort George’s strawberry and rhubarb wheat beer, named “Pi”—claiming to have an IBU rating of 3.14159… taking the term "beer geek" to the next level. At the end of the day, the Fruit Beer Fest is best exemplified by the numerous crisp, refreshing, lower-alcohol brews: summer drinking should be fun, enjoyed in the sunshine, and must pair well with outdoor foods. A real favorite was Laurelwood’s Orange You Glad I Didn’t Say Banana, a sweet/bitter symphony of orange, lemon, and lime, accented by spice notes from grapefruit zest, and delightful effervescence. 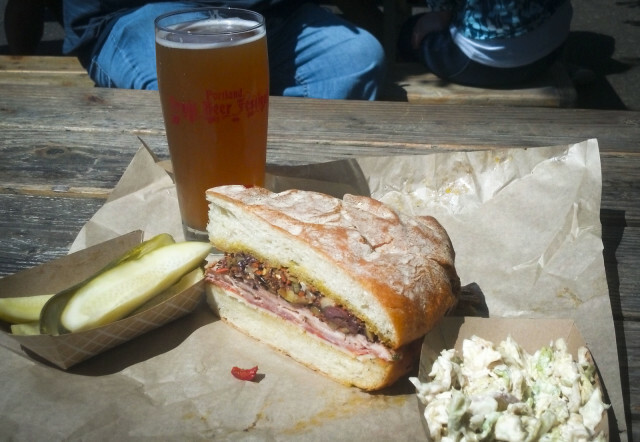 It paired deftly with the salty, briny goodness of Bunk Sandwiches’ muffaletta, a mountain of cured meats, with an olive/caper/cauliflower tapenade on fresh focaccia. And that's not (just) the previous twenty beers speaking.